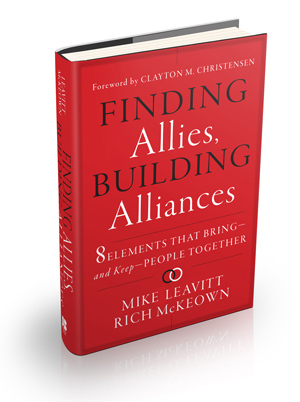 Mike Leavitt and Rich McKeown had a busy weekend, Sept. 28-30. On Saturday evening, Sept. 28, they were the pinnacle presentation at the Utah Book Festival where journalist Jennifer Napier-Pearce facilitated a lively discussion about the book and its concepts. At the Envision Utah annual awards luncheon on Monday, Sept. 30, Mike Leavitt’s keynote sensitized the nearly 400 in attendance to be on the lookout for collaborations that are springing up all around. He used an experience from his youth to illustrate his point. 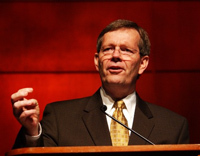 Growing up in Cedar City in rural Utah, as a teenager Leavitt often helped a friend who worked at the local movie theater. “When the time came to change the film reels,” Leavitt recalled, “there would be a white dot flash in the upper right-hand corner of the screen. Once that dot flashed, you had six seconds to make the change. 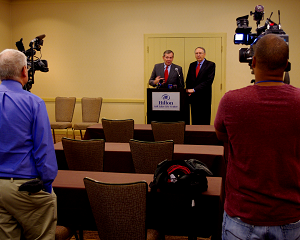 After the Envision Utah luncheon, several members of the Salt Lake City press corps interviewed Governor Leavitt and Rich McKeown. Those news clips will be posted as soon as they are available. For a copy of the Envision Utah case study co-authored by Leavitt Partners and Envision Utah, please click here.